Turn it up loud and set it to full screen. You're going to want to watch this one twice! Want more? Here's another video with even more Jamboree awesomeness. Registration for Boy Scouts and Venturing Scouts is open now! 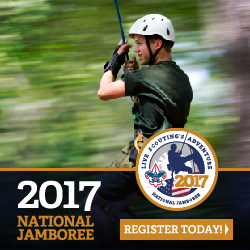 Go directly to http://bsajamboree.org/ to register today! The council committee must make a decision on how many units to send by the end of January, so the time to register is now. To submit an application, you will need your My.Scouting username and password. If you do not have a My.Scouting account, please go to My.Scouting.org and follow the directions to create an account. Please review all registration instructions carefully. Use Chrome, Firefox or IE 10 or above to access the Jamboree application. Other browsers may not be compatible with this system. The presentation deck and questions asked are now available for download. Apply today to lead our youth to the next National Jamboree! The estimated cost of the trip is $1,750. A payment plan and refund policy has been put in place to begin collecting these funds. Preparing Scouts for a once in a lifetime adventure at the 2017 National Scout Jamboree! We will send a fully prepared contingent to the 2017 National Scout Jamboree. To do so, each of us commits to effective communication and valuing alternate opinions and perspectives. All meetings will be held at the Council Service Center at 7 pm. Meetings are typically held on the third Wednesday of the month. Minutes are available by request.